During the day you will be spoilt for choice of things to do and are sure to have unforgettable days out during your visit to Northumberland. The Northumberland countryside and coast are home to awe-inspiring landscapes and whether you fancy a gentle stroll, wildlife watching or adrenaline fuelled mountain biking there really is something for everyone. Often described as “ the land of the far horizon”, there is a wild beauty in Northumberland National Park that so uplifting and bestowing a sense of wellness from being immersed in open and tranquil countryside, surrounded by the sounds and sights of nature and the stars above. You just have to experience it, to feel it. 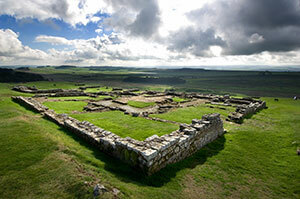 Northumbrians are passionate about their way of life and take pride in sharing it with you. You’ll discover wonderful food, enjoy local festivals and be able to explore ancient sites of international significance. Picturesque towns and villages provide everything you need to make your stay special. Northumberland National Park together with part of Kielder Water & Forest Park, is England’s only International Dark Sky Park (Gold Tier). On a clear night you can see the Milky Way, and even the Andromeda Galaxy (2.5 million light years away) with the naked eye! 2017 saw the opening of the Sill - National landscape Discovery Centre on Hadrian’s Wall. In partnership with the YHA, this brand new discovery centre will transform how people of all ages understand and explore the landscapes, history and heritage of Northumberland and the wider North East. It is a year-round and all-weather venue with accommodation, retail and cafe facilities as well as being a gateway to Northumberland’s landscapes and people. A significant activity programme is on offer to inspire the next generation to continue valuing and conserving this beautiful part of the world. Kielder Water & Forest Park has it all. The views are bigger, the night sky brighter, the sports wilder and the smiles wider. 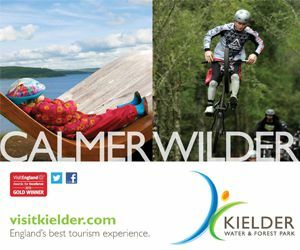 Home to the biggest man-made lake in Northern Europe and, at over 250 square miles, the largest working forest in England, the award-winning Kielder Water & Forest Park is one of Northumberland’s best attractions. A haven for wildlife, visitors can expect to encounter otters, roe deer, badgers and bats. Kielder is home to almost 50% of England’s red native squirrel population, visit the hide at Kielder Waterside and see if you can spot one. 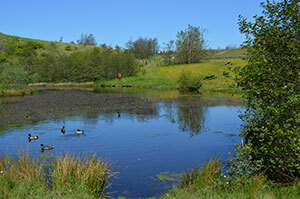 It’s easy to see animals and birds from family nature trails around Kielder Castle and nearby Bakethin Nature Reserve, where a new hide has just been created with views of the lake and the forest. 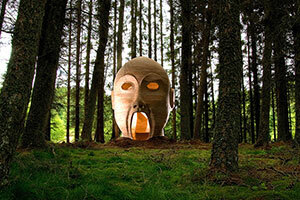 There is also contemporary art and architecture including the futuristic shelter design of the Belvedere, the Minotaur maze and Silvas Capitalis, also known as the ‘giant forest head’. New for autumn 2017 is ‘Castles, Follies and Elephants’ – a series of eight brightly coloured, inspiring installations close to Kielder Castle, which highlights the influences that have shaped the landscape of the North Tyne Valley. Famed for having the darkest skies in England thanks to minimal light pollution, the Park is a stargazer’s heaven. Complete your trip with a visit to Kielder Observatory located in the heart of Northumberland International Dark Sky Park – the largest Dark Sky Park in Europe. A trip to Northumberland wouldn't be complete without visiting Hadrian's Wall, where Romans are still a part of everyday life. Stretching 73 miles from the Solway Coast in Cumbria to Wallsend in Newcastle upon Tyne, Hadrian’s Wall took three legions (approximately 15,000 men) 6 six years to build. Traversing rolling countryside, crossing rivers and hugging the formidable crags of the Whin Sill near Bardon Mill Hadrian’s Wall is an immense feat of engineering. Joining the Great Barrier Reef and Yellowstone National Park as a designated UNESCO World Heritage Site, Hadrian’s Wall is one of the UK’s greatest landmarks. 2017 marks it's 30th year of being a World Heritage Ite, an anniverary shared with Venice, The Great Wall of China and the Palace of Westminster.